Foam Board is white foam with white paper. These are laminated to form the board. Bainbridge Standard White Foam board is ideal for all non-archival mounting purposes. Conveniently lightweight yet sturdy enough to resist denting. Designed to facilitate clean, crisp cuts and edges. Clay-coated for an extra-smooth surface and dual-sided with bright white surfaces. 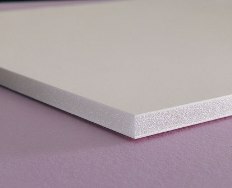 Available in popular widths and sizes, all Bainbridge foam boards are CFC-free.